Irish Soda Bread, made from scratch with currants and buttermilk, is crispy on the outside and perfectly moist on the inside. It is a super easy recipe to make and has a very distinct taste. This subtly sweet bread is a perfect addition to any St. Patrick’s Day celebration. Pin it to your HOLIDAY RECIPE BOARD to SAVE it for later! Irish Soda Bread is one of my favorite recipes to make for St. Patrick’s Day. When I head down to Southern California to visit family, there are a few restaurants that I love to eat. There’s Avila’s El Ranchito which serves the best Mexican food ever (I grew up on the stuff), Wahoo’s Fish Tacos (I have a slight addiction), and Muldoon’s Irish Pub. I know Muldoon’s has lots of great food, but the one thing that keeps me coming back is their Irish Soda Bread. Well, I am very pleased to say that this soda bread was better than Muldoon’s! Now I don’t have to take a 2 hour flight to enjoy one of my favorite sweet breads! 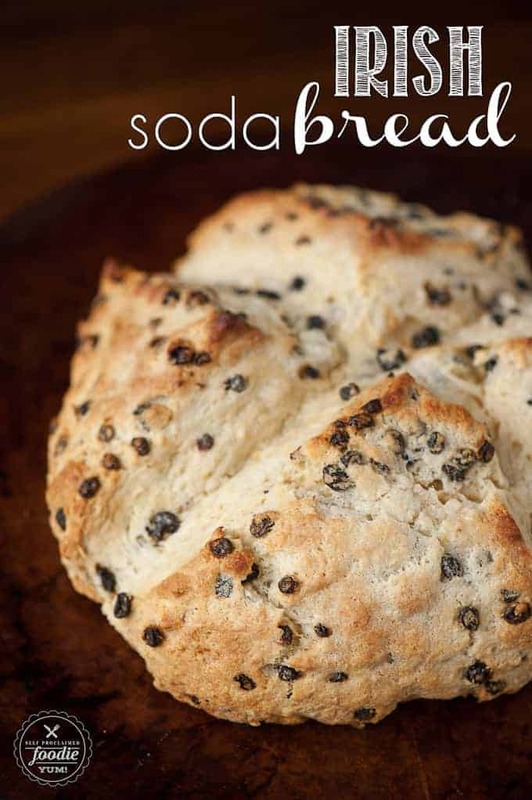 This soda bread recipe is super easy to make. I cooked up some Guinness ribeye steaks along with some brown butter mashed potatoes and sauteed spinach to serve alongside this wonderful bread. The kids loved it too! And to make this bread even more perfect, I smothered it with Kerrygold grassfed Irish butter. Go big, or go home, right? Soda bread is basically a quick bread that uses baking soda, or sodium bicarbonate for all you chemistry fans out there, as a leavening agent instead of yeast. The ingredients, however, of a traditional soda bread are flour, baking soda, salt, and buttermilk. The buttermilk is key here because it contains lactic acid which reacts with the baking soda to form tiny carbon dioxide bubbles. Soda bread is enjoyed throughout the world, but various forms of soda bread are also very popular throughout Ireland. My recipe is what I would call an Irish-American soda bread. We always put our own unique spins on traditional recipes, don’t we? 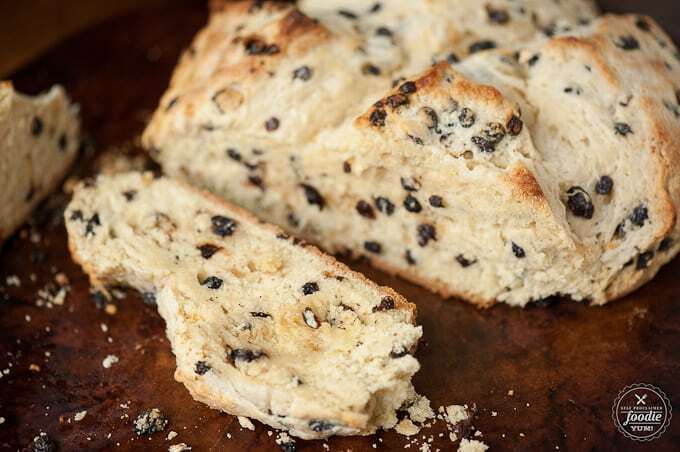 Those minor alterations usually result in more flavor, which this Irish soda bread is full of! I, for one, always have a quart of buttermilk in my refrigerator. It’s inexpensive and is a fantastic addition to pancakes or mashed potatoes. If you don’t have, or don’t like, buttermilk, you can replace it with yogurt or stout beer. Whether you use buttermilk, yogurt, or stout, the leavening action starts immediately so you should use the minimum amount of mixing and get your quick bread into the oven as soon as possible. 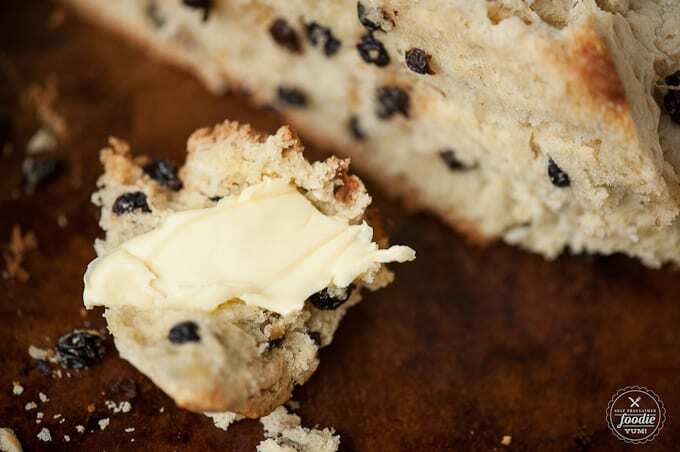 Does Irish soda bread have raisins? If you’ve never cooked with currants, they’re similar to raisins. I honestly don’t really know what they are. I think they might actually be raisins but aren’t called raisins because they come from a different kind of grape? If you know, please leave me a comment and let me know! Anyway, my point is that I hate cooking with raisins (oatmeal raisin cookies – vomit), but currants, especially in this bread, are wonderful. Like with most baking recipes, I mix together all of my dry ingredients. Then, using a stand mixer with the paddle attachment, I mix in the softened butter so that the all of the dry ingredients get coated. Next you combine all of your wet ingredients and add them to the mixing bowl. You don’t want to over mix. To add the currants, I like to add a bit of flour and give them a shake. This makes it so they won’t stick to one another and will help you evenly distribute them throughout your soda bread. Irish soda bread cooks well on a parchment lined baking sheet. 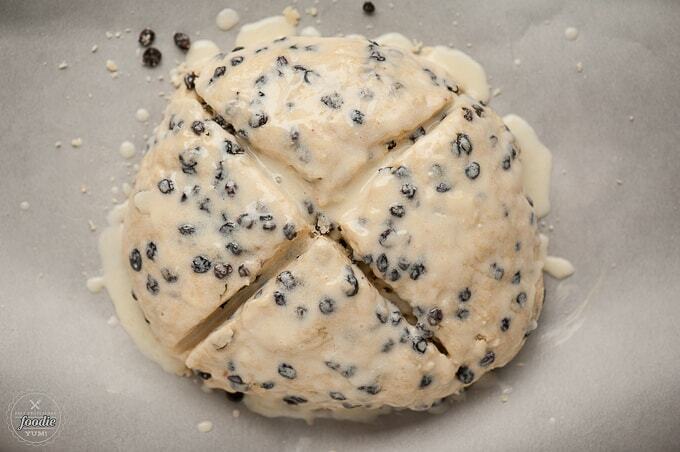 Shape the dough with your hands and cut an x in the top. You cover the dough with a melted butter and buttermilk mixture and continue to do so during the cooking process to keep the top from getting too brown. Then, serve it up warm and enjoy! What does Irish soda bread taste like? I would say that my Irish soda bread is similar in texture to a shortcake biscuit. It is not soft and spongy like traditional bread. Irish soda bread is crisp on the outside and moist and dense on the inside. This recipe is slightly sweet because there is some sugar in the batter, but the currents add some sweetness as well. Is Irish soda bread supposed to be hard? The outside should feel hard, yes. But once you slice into it, the inside should be very soft while maintaining it’s structure. If your soda bread is hard all the way through, it probably means you over mixed it or over cooked it. The outer layer should be hard enough that you can hit it with the side of your knife like a drum and it won’t break or collapse. This crisp outside makes it easy to slice and gives it a sweet crust. Pressure Cooker (Instant Pot) Corned Beef and Cabbage – It doesn’t get more Irish than corned beef and cabbage, right? This salty and full flavored meal complete with baby potatoes and carrots would go great with a side of soda bread! Irish Cheddar Shepherd’s Pie – I went as Irish as I could with this recipe and used Kerrygold butter and cheddar! A warm piece of soda bread will make you feel like you’re in an Irish pub. Don’t forget to serve it with a tall glass of cold Guinness stout! Ideally, you’ll want to make your soda bread and eat the entire thing. It absolutely tastes best when fresh. If you need to store it, wrap it tightly in plastic wrap or store it in an airtight container. You can store soda bread at room temperature for a couple of days. If you need to store it longer than a couple of days, keep it in the freezer and allow it to thaw at room temperature before serving. Is Irish soda bread good for you? This is one of those anything in moderation isn’t that bad for you recipes. This is bread, sweet bread at that, and any traditional bread made with traditional flour rarely qualifies as healthy. Is it as bad as a deep fried snickers bar? No. But does it qualify as healthy? I wouldn’t say so. Would you? Irish Soda Bread, made from scratch with currants and buttermilk, is crispy on the outside and perfectly moist on the inside. It is a super easy recipe to make and has a very distinct taste. This subtly sweet bread is a perfect addition to any St. Patrick's Day celebration. Combine the flour, sugar, baking soda, and salt in the bowl of stand mixer fitted with the paddle attachment. Add the butter and mix on low speed until the butter is mixed into the flour. In a measuring cup, combine buttermilk with egg. With the mixer on low speed, slowly add the buttermilk mixture to the flour mixture and mix until just combined. Place the loaf on the prepared sheet pan, shape into a circle, and cut an X that's about a half inch deep into the top of the bread with a knife. Combine melted butter and buttermilk and brush over top of bread to coat. During the cooking process, continue to brush the top of the mixture every fifteen minutes or so until you've used all of it. Bake in preheated oven for 40-50 minutes until an inserted toothpick comes out clean. 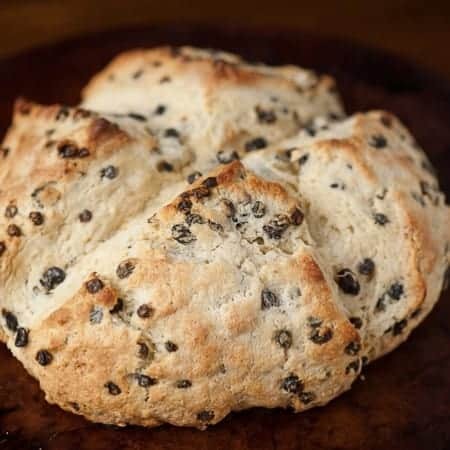 This Irish Soda Bread looks amazing! Yum! Visiting from Wednesday Whatsits! Um. You stated that banana and zucchini breads are similar to this but they use eggs and soda bread does NOT. Lo and behold, when you get to the recipe, there it is, 1 egg. Can you explain this? I mean, we readers take your word that you know what you write about. This isn’t an ok oversight – it’s a blatant contradiction. Too many times recipes are just wrong as if the publisher never even tried their own recipe! Its disappointing and I’m starting to call foul when I see this. Even Martha Stewart has erroneous info on some of her recipes. Important to be accurate here especially when baking. My two cents. Just saying. Also I live very near Muldoons and they also use Caraway in their bread. IMHO without that distinct flavor – nothing can compare.